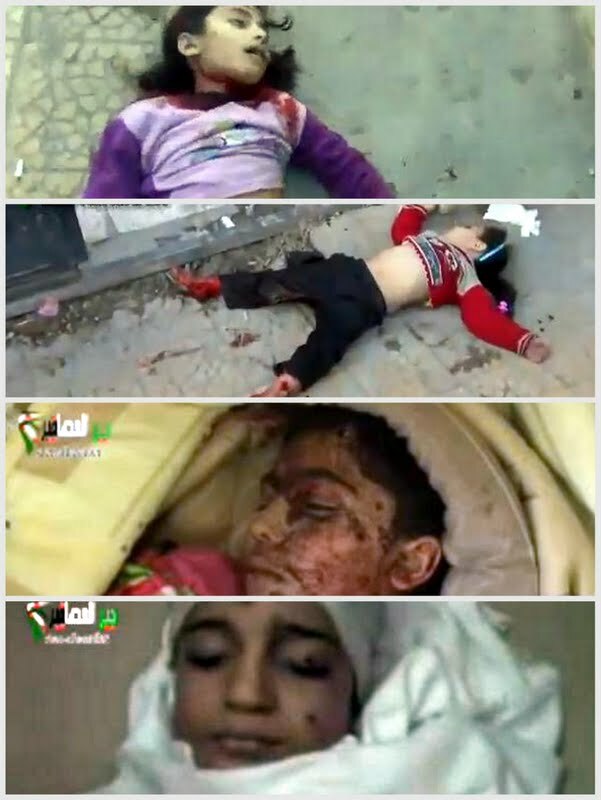 (Washington, DC) – Compelling evidence has emerged that an airstrike using cluster bombs on the town of Deir al-Asafeer near Damascus killed at least 11 children and wounded others on November 25, 2012. The Syrian government should immediately cease its use of this highly dangerous weapon, which has been banned by most nations. According to video footage and testimony from local residents, at least 11 children were killed in the strike on Saraya neighborhood in the eastern part of Deir al-Asafeer. Two residents told Human Rights Watch that the cluster bomb strike occurred as a group of at least 20 local children were gathered in a field where they usually play. Around 2:50 p.m. a MIG-23 appeared in the sky. I was 100 meters away from the playground. I looked outside and saw the MIG hovering around and then release six cluster bombs as it flew away. I saw two breaking in half. Then I heard a series of small explosions. It sounded like fireworks but of course louder. Then I heard people screaming and running toward the playground. I followed them with the rest of the men who were with me. When I reached the playground I saw five children dead and many others wounded. The severely injured children were taken to nearby hospitals and the ones with lighter wounds to a field hospital. A Human Rights Watch analysis of videos posted online by Syrian activists of the scene of the attack indicates that at least three RBK-250/275 AO-1SCh cluster bombs were used in the strike. Each RBK-250/275 AO-1SCh cluster bomb contains 150 AO-1SCh antipersonnel fragmentation bomblets and creates a destructive footprint of 4,800 square meters (52,000 square feet), the equivalent of a United States football field, according to a standard international air-launched reference guide. Markings on the cluster bomb remnants indicate they were manufactured in the Soviet Union in the 1970s. There is no information available on how or when Syria acquired them. Video footage posted by Syrian activists of the immediate aftermath of the attack shows children and adults lying severely wounded on the ground, with injuries consistent with those caused by cluster bombs. Cluster bomb remnants and local testimony indicate that one bomb landed in the field where the witnesses said the children were playing, a second bomb landed on a house less than 50 meters away, and the third bomb landed in farmland approximately 150 meters from the field. One video shows unexploded bomblets found in the field where the witnesses said the children were playing. On the video, a resident who lives next to the field says that at least six children died in the field from the attack: Shahd al-Lahham al-Omar, 4 years old, Mamdouh Shehab, 11, Mohamad al-Shafouni, 11, Roba Youssef al-Ali, 13, and two other unnamed children. According to local residents, a second cluster bomb remnant was found less than 50 meters away from the field and killed four children in a house: Mohamad Bassel al-Lahham, 5, Eman al-Lahham, 12, Adnan al-Hussein, 7, and Anoud Mohamad, 12. An old man was also severely wounded. The witnesses said that there is no base for the rebel Free Syria Army (FSA) near or around the area. “There is no FSA equipment, machinery or anything else around the fields or near the farmlands,” one resident told Human Rights Watch. Another said: “There were no FSA vehicles or machinery visible. FSA soldiers do not live in residential areas.” Human Rights Watch has not been able to confirm independently the presence or otherwise of any fighters but the large number of children playing outside at the time of the strike would be consistent with the absence of any fighting in the immediate area. From the video footage, Human Rights Watch identified more than 50 unexploded AO-1SCh bomblet remnants. Unexploded bomblets pose a deadly risk to those who handle or approach them. There is an urgent need for risk education and support to emergency clearance efforts in Syria to tackle the unexploded ordnance created from the use of cluster munitions and other explosive weapons. Two witnesses told Human Rights Watch that a MIG warplane flew over again that day and dropped approximately six cluster bombs on another neighborhood in the eastern part of Deir al-Asafeer. Previously, in October, Human Rights Watch documented an increase in the use of cluster bombs throughout the country by Syrian military aircraft. “All governments, including Syria’s allies, should condemn Syria’s continued use of cluster bombs as these weapons are subject to a ban under international law due to the harm they cause to civilians,” said Wareham. “A much stronger response is needed to convince the Syrian government to stop using cluster bombs. At least 16 governments have condemned Syria’s use of cluster munitions, including Austria, Belgium, Denmark, France, Germany, Ireland, Japan, Mexico, Netherlands, New Zealand, Norway, Portugal, Qatar, Switzerland, the United Kingdom, and the United States. A majority of the world’s nations have comprehensively banned the use of cluster munitions through the Convention on Cluster Munitions, which came into force on August 1, 2010. Syria is not a party to the convention and did not participate in the 2007-2008 Oslo Process, which led to creation of the treaty that bans cluster munitions and requires clearance of contaminated areas and assistance to victims. A total of 77 states are party to the convention, while another 34 have signed but not yet ratified. Cluster munitions can be fired by rockets, mortars, and artillery or dropped by aircraft. They explode in the air, sending dozens, even hundreds, of submunitions or “bomblets” over a wide area. These submunitions often fail to explode on initial impact, leaving duds that act like landmines and explode when handled. In May, new cluster munition use was reported in Sudan, another country that has not joined the Convention on Cluster Munitions. In 2011, Libya and Thailand, neither of which has signed the convention, also used cluster munitions.